I posted several years ago about the various identification methods for pets and how important it is to keep ID on your dog. Of course, ideally, he or she will never be lost! Being able to track your dog when they are missing could certainly help make that a reality. Shibas aren’t big dogs; Snickers, Secret and Zuki are 24, 17 and 16 pounds respectively. I was concerned that the Tagg unit would be bulky and unwieldy on their collars, especially since they were all used to wearing a very thin mountain rope collar as their 24/7 ID collar. All three seem to not be bothered by the additional weight though. I liked the natural look better than the thick collars and GPS tech, BUT I like the peace of mind with them wearing trackers even better! 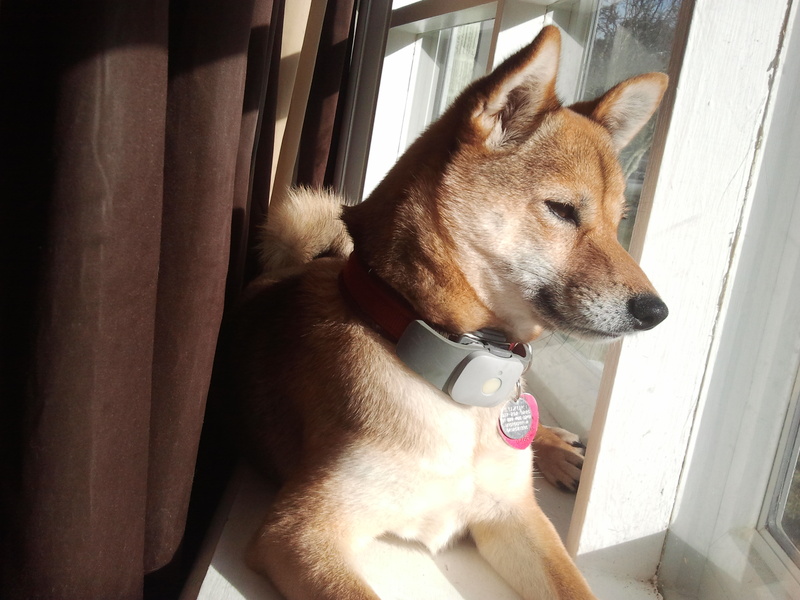 I bought small Cozy Collars from Spindrift. They are fleece-lined, the Taggs fit on them well and they don’t seem to be messing up the dogs’ fur so far. The Tagg units don’t send constant updated location information to the server 24/7 (as that would run the batteries down pretty quickly), but you can log into pettracker.com or use the iPhone or Android app to request an updated location any time. I’ve tested this several times. It’s not exactly accurate, but it’s off by about the same angle and distance every time (which will definitely be good to know if/when I’m tracking one of my dogs someday). The inaccuracy may be caused by the fact that I live in nowheresville, but I’m not sure about that. The location address and a map are sent by email as well as being displayed on the website and apps. If you initiate a tracking session then you will receive updates every 3 minutes for a 30 minute duration. Personally, I don’t think this is often enough for tracking a Shiba, so I would use the Android app and keep clicking Locate for an updated location. 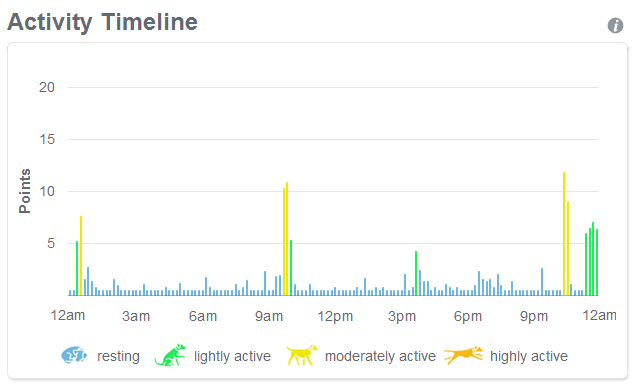 One super-nifty feature that I wasn’t aware of until I actually activated the trackers is activity tracking. In addition to the GPS transmitter, each tracker also contains an accelerometer. 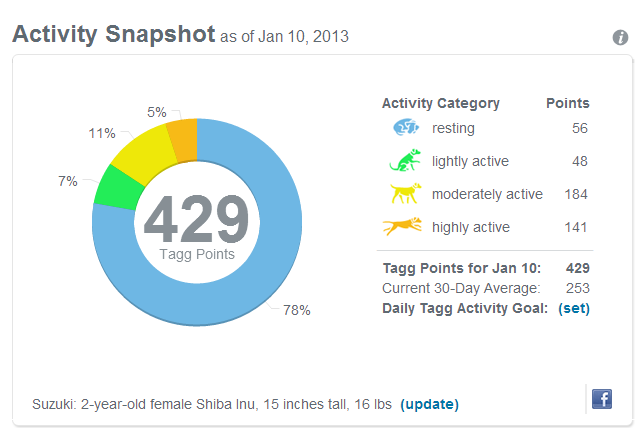 The accelerometer records the dog’s movement and the data is synced to Tagg’s server at least once a day. You can log into pettracker.com to see illustrative charts. Tagg also assigns and displays "Tagg Points" (sort of like Nike Fuel Points) based on the quantity and and quality of activity. It’s interesting to see the ebb and flow of the dogs’ activity during the day. There are clear spikes that correlate with morning wake up, meal times, lunch time (for Snickers, at work with me), when T gets home from school (for Zuki and Secret), when Snick and I get home at night, etc. It’s obvious also, that Zuki is naturally a lot more active and Secret is the least active. Since we don’t live in a neighborhood where we can go for walks, I don’t feel like any of them are getting enough exercise. The Tagg Points will give me an easy way to set goals for them and make sure we meet those goals! The website and Android app (and maybe the iPhone app, but I haven’t used it), need some work to be user-friendly. I’m hoping the disjointedness of it all is because Activity Tracking is new and they haven’t integrated it yet. When you log into the website, the initial view is a map showing your dogs’ locations. This is good. Each dog’s individual profile is listed to the side of the map. The size and placement of the profile links make it appear as if clicking through to the profile would be useful, but it really isn’t. All you can do on the profile page is, um, edit the profile. There are no links to the dog’s location or their activity tracking data. The profile page is tabbed, so you can easily switch between dogs. The menu across the top of the page has a "Home" link and a "Map" link which both take you to the map. 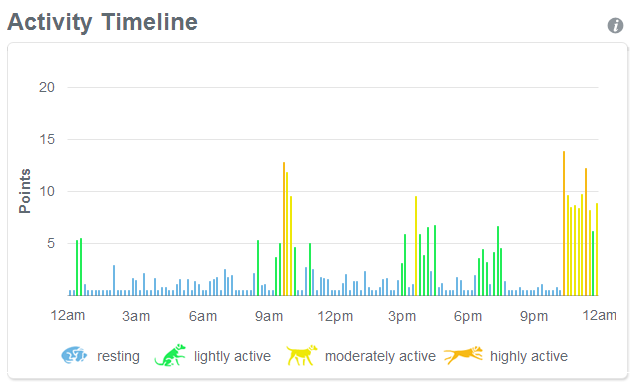 The next link is "activity tracking" which takes you to all the nifty activity charts. This page is tabbed as well, so you can easily switch between dogs. The remaining links are "Notifications," "My Account" and "Shop." The Android app lists each dog with a photo; last update date, time and location; and the battery meter. Clicking through takes you to a location map. No activity data is available in the app. In my opinion, the website would be more useful if the "Home" link displayed an overview of each dog similar to the Android app, but with more detail. Clicking through should show you the dog’s profile info, location and activity data, all in one place, with a link to edit the profile if needed. Keeping this as a tabbed page for easily switching between dogs would be fantastic. Adding a snapshot of each dog’s activity tracking to the Android app would be nice as well. I love my Tagg Pet Trackers even more than I expected to and I hope they’ll only get better over time with software, website, and app updates. The “left the home area” alerts are very reliable now. Sometimes it will take 10 minutes before it comes, but it always comes. Customer service is practically non-existent. You can’t do ANYTHING on the website that you would expect to be able to do and sending email to customer support always results in a reply saying they can only help by telephone (during their very limited telephone support hours). It’s incredibly annoying. The battery life and accuracy of the Taggs has been stable. Zuki occasionally knocks her Tagg halfway off. She was able to chew the first one pretty badly, so I had to replace it. Thankfully, the Tagg system DOES send an alert when this happens, so – if I’m home – I’m able to grab her and fix it before she chews on it. The Spindrift collars that I purchased have totally ripped Secret and Zuki’s fur. They each have a trough where their collar goes around their neck. For them it’s OK. For Snick though, it means that he no longer wears his Tagg 24/7. He only wears his Tagg on his Spindrift collar at home if I’m not home with him and he wears his Tagg on his harness when we go out. 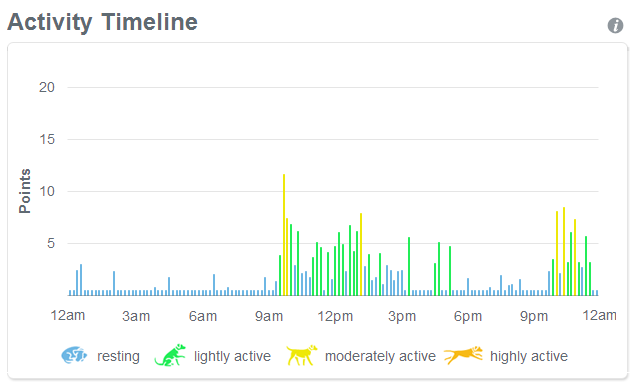 I never look at the activity tracking data. The Android app has improved considerably. The website hasn’t changed. Thanks for the info! I didn’t know about those Tag Collars but I think it’s a great idea. We all say that would never happen with my dog and then it happens. Sometimes with tragic consequences. My 9-lb shiba can jump my 6 foot fence and with darting out the door got out 6 times in the first month we had her! At first the cost looked like a lot – $90 for 3 months! – but then I saw that it’s $8 a month after the initial 3 – that’s really not bad for the peace of mind knowing I could quickly find her! and for peeples who haz more doggies, it only costs 0.95 per month per dog after the first one! @Snick_the_Dog Is that Zuki? She’s very good looking! @Snick_the_Dog hmm…my humom is checking these out but she thinks it seems kinda big. Wow, thanks so much! I’ve been thinking about trying this product but had a ton of questions. Turns out, they were the same ones you had and answered here. This is going on my To-Get list! I also find it a peace of mind knowing that IF my home ever got broken into again I would know if someone had stolen my dogs or if they were let out of the house. I also would be able to track the thieves providing they are the normal dumb thieves that wouldn’t know what the tracker is. I live in the suburb of a large city and it is very pinpoint accurate where I am. Great investment! I also use them when we go on vacation in case they get loose from us there. I just take the base and change the home zone. @Snick_the_Dog You can run, but you can’t hide thanks to Tagg! Hope your mom has peace of mind knowing you are safe at all times!